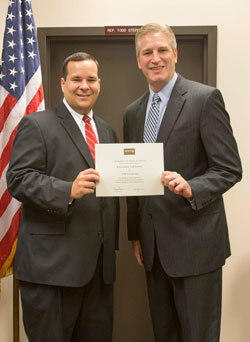 Neal Lesher of the National Federation of Independent Business presents Rep. Todd Stephens (R-Montgomery) with a certificate recognizing him as a Guardian of Small Business. HARRISBURG - The National Federation of Independent Business (NFIB) has recognized Rep. Todd Stephens (R-Montgomery) as a 2014 Guardian of Small Business for his legislative work on behalf of Pennsylvania’s small businesses. The new law increased the cap on Net Operating Losses for two years and created a $5,000 deduction for small business start-ups. It closed the so-called “Delaware Loophole,” used by some businesses to avoid paying Pennsylvania corporate taxes, and it exempts all assets of family-owned businesses being transferred between family members from the inheritance tax. In addition, Stephens supported the transportation infrastructure funding plan (House Bill 1060) allowing for state investments in roads, bridges and mass transit; and House Bill 1513, which prohibits businesses from being charged the gross receipts tax twice by separate municipalities for the same earnings. Stephens also supported several other pro-business bills now pending in the state Senate, including one creating the Pennsylvania Business Development Authority to streamline programs and help businesses grow.